You may remember Samantha and Brian from their engagement session not too long ago. After their session, I designed a set of custom Save-the-Date cards using one of their favorite engagement photos. 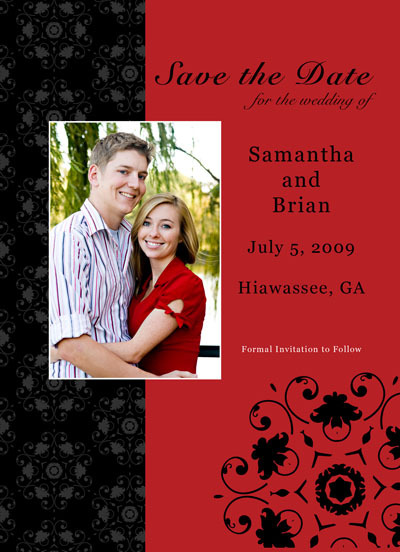 The Save the Date cards are flat 5x7 or 5x5 cards with printing on both sides. 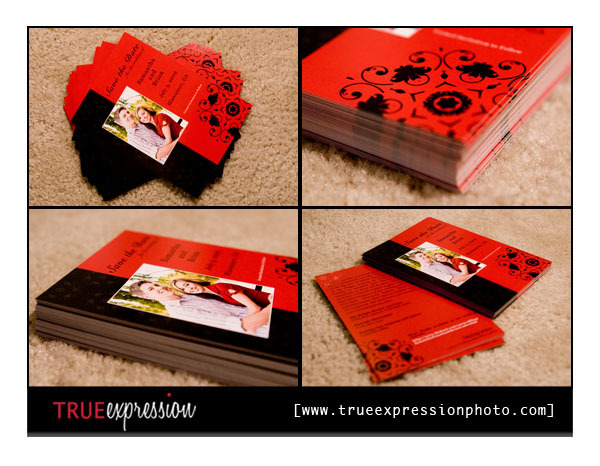 All cards are custom designed to match your wedding colors and feature a photo from your engagement session. The back of the card can contain additional photos, a matching background or a note with travel info for your guests. So, if you have already had an engagement session with me, contact me to order your own set of cards. Or if you have not had your engagement photos taken yet, contact me at info@trueexpressionphoto.com to schedule your engagement session! Too cute! Loving the design on these! Great work! Love the red and black - bold and beautiful!